In ten days we’ll have been in Ukraine for six months. Crazy. On one hand it feels like “Where did the time go?”, but mostly it feels like a whole lot longer than that. I don’t say that in a negative way, just in an honest way. Every thing has changed. Everything. In Ezra’s words, “Everything about Ukraine is different…except McDonalds.” It feels like a very long time since we and our 12 suitcases (TWELVE!!!) crossed the ocean. It feels like much more than 6 months ago. In many ways I feel great right now. I feel like we’re in our groove with MTU. We are loved there and we love many people there. We have a bit of a schedule there and are able to be a very practical help to them. Of course the work at Romaniv is AWESOME and we are loving that. We are pretty good at shopping now, we know the bus routes, we were able to actually communicate with our landlady last week without calling any English speakers for help. In some ways we have really grown and feel at home here. In other ways we struggle. I won’t speak for Jed about his struggles, but I thought I would share a bit of my own. I think I have a tendency to always write about the good and neglect sharing about the bad or the difficult. I don’t want to be a complainer, and sharing your struggles is really putting yourself out there. Not many people enjoy doing that…but I feel like I need to do it. It’s not a fair picture to only paint the good. This is real life, and I’m determined to be a real person. So, here ya go. The past few weeks were hard for me, probably the hardest yet. Things are getting better now, but it was a bit rough, internally. Let’s just say I’m having a harder time letting go than I had anticipated. My Mommy heart has been struggling in big ways. Of course when we were preparing to move here I anticipated that I would experience loneliness and isolation. I knew I would miss my family and friends, my church, the familiarity of every day life. I do miss all those things, but I can deal. I know that I know I’m exactly where God wants me to be. I am learning that He is enough, and He continues to give me the strength to say yes. I guess what I didn’t anticipate was how difficult this road would be as a mother. Really, how could I anticipate it? I had no one to talk to who had followed this path before, and anyone with a bit of a similar situation experienced their story in a different culture than this. I still have no one to talk to who has walked this road before in Ukraine. But, I’m learning to be okay with that. The thing is, I’ve been subconsciously trying to recreate my childhood, a middle class American childhood, in Ukraine. Ummmmm yeah….not gonna work. I KNOW THAT. I know we don’t live in suburbia America. I know that EVERYTHING is different (I said that already). But knowing that, and living that are two different things. I’m just now learning how much of my mothering expectations and family expectations are based on American culture. It’s all I know! Of course I expect what I know. I don’t know anything different. I don’t know how to mother my children in this place. Jed and I chose to come here. Our children didn’t get a choice. I don’t know what to do when they’re on the playground and they are surrounded by children they can’t speak to. Do I push them to go try to make friends or do I let them just be their own little island, playing only with each other? I don’t know what to do when my Hava comes up to me crying at a picnic full of kids because she has no friends and no one will play with her. I don’t know how to continue to build their English reading and writing skills when they are in Ukrainian school. Ezra was just really learning how to read and write in English, and now his day is spent reading and writing a language he doesn’t understand. What do I do with that? I’m not sure any of my favorite home school books cover that scenario. Let me tell you, it’s not as easy as all that. It just plain isn’t. Maybe in some cultures kids don’t need language to make new friends, but in this culture they do. This isn’t the most open culture. Kids are shy. Kids are more closed. We are the oddity in our town. We are like a walking zoo. Ha! There is no one like us that I know of in our town, and it shows. Our kid are understanding more all the time, but they can barely speak to other children. I know, I know, it’s only been 6 months, but I can vouch that 6 months feels like an eternity when your kids’ hearts are involved. It’s just plain hard, and for the past few weeks I’ve felt tired and discouraged. I want my kids to be able to talk to other kids, just chat and goof around. I want other kids to know them. They are great little people, but no one knows that because they can’t speak. I want them to have friends and to be able to respond when approached by other children. I want those things, but then I wonder, how many of my expectations are based on modern American culture, and how many are really essential for their health and happiness? The kids are happy. Sure they are awkward in social situations, but otherwise they are happy. They have each other and they love each other deeply. They are happy to run and play together, regardless of what other kids around them are doing. They are like a little tribe, oblivious to anyone else. So I find that I’m putting expectations on their childhood that they don’t even have for themselves! They don’t know what my childhood was, so they don’t have that expectation for their own. They don’t see other kids’ lives on Facebook and compare them with their own. What they are experiencing now is their own childhood, and it is shaping them just as my childhood shaped me. For instance, right now we’re reading through the Little House on the Prairie books as a family. In Little House in the Big Woods, I was struck by how infrequently Mary and Laura had contact with other children. They were mostly just home with Ma and Pa, yet according to the books they were as content as can be! They weren’t pining away for sleepovers and play dates…the Big Woods was what they knew and it was enough. When they drove in to town for the first time Laura describes how they saw children playing outside the houses. Never was it mentioned how she wished she was one of those children with tons of neighbors all around. They had the security of their family. They knew they were loved. They had each other and they were content. My children don’t pine away for sleepovers and play dates and home school co-op, but I find myself pining away on their behalf. I guess it’s because I know that’s what their American friends are doing and I feel they are missing out on what “should be”. In my mind, those things are what make a childhood. BUT, there are plenty of varieties of “happy childhood”. Of course they miss their friends, and if given the option they would love to be a part of that life again, but they rarely talk about it. Their life is here. They have each other. They have our love. Their life is rich here and most of the time they seem content. But then there is the occasional Skype or Facetime with a friend back in the US and things begin to unravel. I want them to be able to keep those friendships, but it is hard on their little hearts. Sigh….I think that’s another topic altogether. Those are the thoughts and ramblings that have been tearing at my heart. My heart knows that my children were called here. My heart knows that they need to live here and this needs to be their life experience in order for God to make them fully who He intends for them to be. But knowing all of that doesn’t make this easy. It’s hard to watch your children struggle. It’s hard when everyone blows it off and makes it sound like all of this adjustment will come easily to them. Maybe in the long run we’ll look back and see that the struggle was brief and it did, in fact, come easily, but in the meantime it doesn’t feel easy at all. Just because a pregnant woman had a quick labor doesn’t mean the labor didn’t hurt. So, I continue to work at letting go. I give my kids over to God and trust that He knows what is best for them. I trust that He will give us wisdom when no parenting or mothering book seems to apply (because none of them seem at all relevant right now). I trust that this will get easier and slowly they will find their place in this culture. Most of all I am working at letting go of my priorities and desperately seeking God’s priorities. Who cares about sleepovers and play dates if their little hearts are far from the Lord? This world is not all that there is. We were made for eternity! This life is a blink of an eye compared to what we were really created for. Our main job as parents is not to find our kids more friends on the playground or insure they are happy and accepted at school. Our main job is to point them to Jesus. I want my kids to see that He is all that matters and living abandoned to him is worth it. It.is.worth.it. On the hard days when we are lonely and feel like we don’t fit anywhere- He is worth it. I want to end my race having absolutely spent myself- holding nothing back. I want that for my children. Fun in the Sun…THANK YOU! So. Right. On. It’s all about Him and He is opening your eyes (all of our eyes) to all the ways we’ve given in to the love of this world instead of Him. You will not be disappointed, nor will your children. They are His. You keep pointing!!! Love you and miss you! I think your honesty just might be my very, very favorite thing about you! Thank you for being real; now we know how to really pray for you! It feels like a lot longer than six months for me too! LOVE YOU! I owe you an email my dearest! I’ll get right on it! LOVE LOVE LOVE you too. I’m so glad you wrote this. Honestly, I’ve been comparing my journey to yours because we both left Salem at the same time for new countries. And when I’ve been struggling, it seems like there was always a new blog from you saying how much you LOVED your new country and people when I really just wanted to chuck mine down the drain (which, of course, would be smaller than an American drain because nothing is the same size here!) and go home. And I would feel so pathetic, like you’re a better Christian (I KNOW in my head that you can’t compare things like that, but that’s what the irrational, I-just-want-my-mom part of me thought) because you’re growing by leaps and bounds in Ukraine, and accepting the hard things joyfully, while I’m desperately trying to do the same but maybe not with the same joyful attitude. But boy do I know EXACTLY how you’re feeling in regards to the kids. Not so much with the language barrier, but everything else! My kids are missing out on so much back home. Jack’s little heart breaks so often, especially when he sees what he’s missing through Skype, or when the kids here make fun of him for his accent, or the way church here is SO inadequate compared to the thriving church movement back home and I worry about what Jude isn’t learning that Jack did at that age. Thanks for sharing, friend. I am so with you. And thankful that we serve a God who knows and cares about all these details. I know, I can’t wait! Wow, the pain we feel as we want for our children. Thank you for your honesty. Your love and concern for your beautiful children is almost tangible in this post. I do hope that you and they will find ways of “connecting” with friends old and new, on both sides of The Pond, in the time ahead. 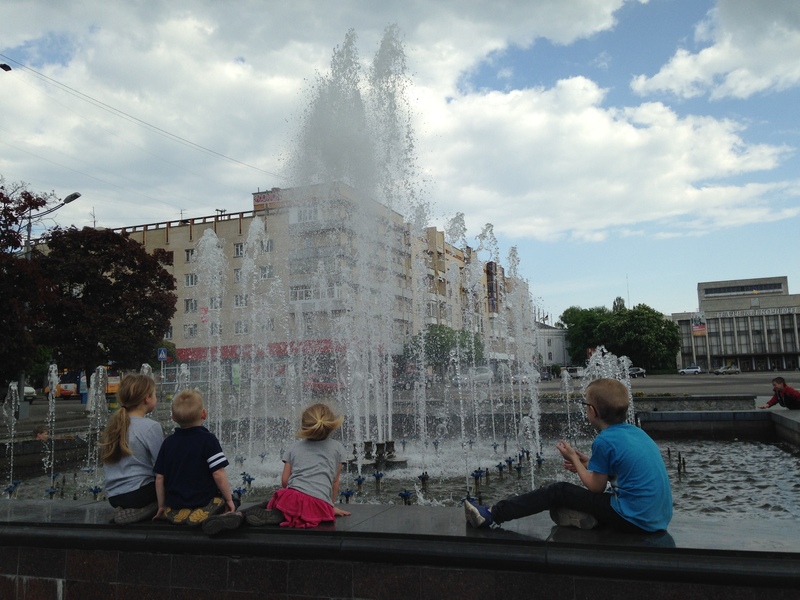 Meanwhile, are you familiar with/in touch with Bible Orphan Ministry, also in Zhitomir? They are a tiny but very effective all-Ukrainian group which works with and serves over 1,000 kids and young adults in ten orphanages and institutions in and around your city, providing material and practical assistance, Bible lessons, and guidance for teens who’ve aged out.. Check out their Facebook and blog – Alla V., who keeps both the Facebook page and the blog, is just great, as are her fellow BOM members. It would be great it BOM and Wide Awake could team up! So glad you have met with BOM – I hope you can reconnect. Right now, BOM has just successfully completed a fundraiser to help provide 70 orphanage graduates with a few things: Bibles, cooking utensils, dinner plates, soup bowls and mugs, individual place settings, comforters, etc. – basics, but precious and greatly needed by teens who have nothing. BOM welcomes donations of clothing and other items for all those they serve – see recent comments on Alla’s blog for info. about sending packages to Ukraine. Clothing for teens is greatly needed right now. It can be new or gently used and clean. Last year BOM’s staff went to a huge street market in a city about 200 miles away to purchase some of the gifts for graduates – prices were very reasonable there and their funds went farther. I expect they’ll try to do the same this year, so they may be away for a while this week. They wrap the gifts very attractively, which helps make the extremely poignant graduation ceremonies a little more hopeful. With 70 graduates to “gift” this spring, perhaps BOM could use some help with all that wrapping! I’m pretty sure BOM also visits the men and boys’ institution you visit – I know they’ve provided privately paid caregivers to a nearby men and boys’ institution, to improve the quality of care. They selected two very sweet ladies who are gentle and affectionate with the boys. They also help with basic supplies, clothing, toys, etc. Let me know via email if you’d like Alla’s contact info. They are working with a few families who have children close to the age of your youngest, in addition to working with the orphanages and institutions, so your children might find new friends and playmates through BOM! Best wishes to you and your family – I hope things will begin to feel more comfortable as you gain familiarity with your new home. Cousin to 2 from U.
I already commented on Facebook, but I just keep thinking about this. There’s no arguing with the fact that you feel alone, of course, but I do know more than a few families now who have moved over here with children. I wish there was some way for you to get together with some of them! And the part about mothering and family expectations… yes! I feel so weird, because even though I grew up in America, I’ve only mothered here, and that is what has shaped it all for me. So, when I think about how I feel on visits to America, I think I can understand a little of what you’re in right now. It’s so hard to even express it. What’s different? Um, yeah…. everything? But nothing so obvious that I could just list it off. Anyway, I’m praying for you. Thanks so much for your encouragement and prayers. Yeah, there just isn’t anyone in our area that I know of, but it’s okay. God knows our needs and if He has someone in mind for me to connect with I know He’ll make a way. I think right now He’s saying “Lean on me, not on man.” You know? I’m gaining some good perspective. I’m excited to check out the missionary mom blog. Thanks for sharing! Hi Kim, You are a great mom. You love your kids and they know it. Where can I change my credit card info for the my monthly gift to Wide Awake Family? Awww Jan, thank you!! Thank you so much for your faithful support. 🙂 I’ll have Jed contact you about your card. He’s the smarty about all that…I’m clueless. Ha! Hi Kim, Just wanted to say I’m thinking of you and can’t imagine how it feels. My 14 year old daughter sometimes comments/complains that we shouldn’t have taken her out of gymnastics after several years of lessons – she wishes she’d stayed with it and mastered it. We took her out because she couldn’t progress to the next level, she started too old (insert laugh here – should have started at age 2 or 3?!) and couldn’t learn the flips. She would dread going to the training as time progressed. Deep down, I do regret pulling her and wished we’d just pushed through the tough times. I know it’s completely different but thought you’d enjoy a laugh. Sometimes when you get some time and distance you can see that things you thought were so important to a decision really weren’t all that important . YES YES YES!!! Thank you Sue! You made me smile and your comment was so good for my perspective! I love it. Let’s keep our priorities straight, shall we? THANK YOU! Dearest Kim, much of the answers escape me, I have never really been in your shoes. With Harry being in the Air Force for 23 years we did move a lot, which meant our children changing schools and friends. Our middle 3 were very close in age and the integration seemed easier because they had each other. The other two were 5 years older and 4 years younger and it was tough for them. I know we spoke the same language, except when we were in the South. But the culture in every State was very different from ours. But we felt we were called by God to do what we were doing. As I look back he did use us in unusual and wonderful ways. We always walked with the Lord and trusted HIm to work it all out, which He did. All I can say is “Trust in the Lord with all your heart and lean not on your own understanding. He will work it out”. I will pray that God will give you both great wisdom and peace. Your love for them and your strong faith will serve you well. Although the situations are completely different, my heart resonates with much of what you said… I am in the midst of raising a sweet little boy with autism, adopted 8 months ago. When he first came home he had absolutely zero interest in other kids but over the past couple months he has been showing an increasing desire to play and interact with them which has been a huge step for him. Unfortunately, I have yet to find any kids who want to play with him… 🙁 Although he came to me “non-verbal”, my little miracle boy is now talking up a storm but he is not very clear and is incomprehensible to most people outside the family, especially kids. It is so hard on my mama’s heart to watch him try so hard to say hi and play with other kids, only for him to be ignored, left out, and/or laughed at due to his lack of language (and developmentally appropriate play/social skills). Anyway, this comment is not to say that I get it, because I have not lived what you’re living right now, but simply that as I pray for my son’s heart and wisdom in how to best help him, I will be praying for you and your kids as well. Hang in there and keep holding on the the One who hold both your heart and theirs. Completely understand your mama’s heart… right there with you… even though T was born here & speaks the language, the fact that his brain is wired slightly differently & the fact that we parent differently from the people here, it already makes a difference & sometimes he does get picked on or ignored – i can only imagine what your heart is feeling, my dear friend. BUT you are so right – our job is to point our children to Jesus & if that makes us stand out, then so be it – it is worth it 🙂 Thank you for being so brave… May the Lord continue to bless you all with the riches of Heaven!